AMSOIL EaBP Filters are high efficiency by-pass filters that also remove soot. 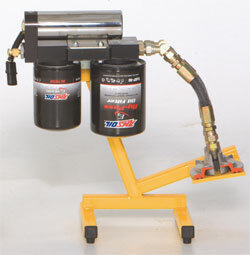 Call 800-579-0580 for current price or Visit our new site covering the AMSOIL Bypass replacement oil filters. This link takes you to the AMSOIL Bypass Filter Kit section - Attach these filters and kits to any vehicle! Four sizes now available. See chart below. In an effort to continually enhance the AMSOIL product line, new technologies are evaluated to provide the best products for AMSOIL customers. Consequently, AMSOIL is now offering new by-pass filters from its revolutionary Ea line of filtration products made in USA. 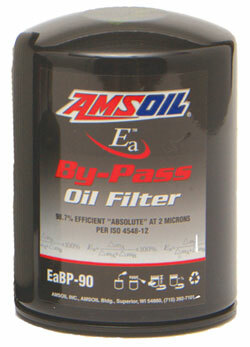 AMSOIL EaBP Filters are low cost spin-on, high efficiency by-pass filters that also remove soot. AMSOIL EaBP Filters have an efficiency of 98.7 percent at two microns, compared to the AMSOIL BE Filters’ 98.6 percent efficiency at three microns. At normal operating RPMs the EaBP Filter will filter all of the oil in a typical five quart sump in less than 10 minutes. The superior construction of AMSOIL EaBP Filters provides better sealing and increased longevity along with superior corrosion resistance. AMSOIL EaBP Filters have a marine powder coated exterior. Their zinc-dichromate base plates increase rust protection, and they feature the same dimensions and threads as BE-90, BE-100 and BE-110, so they are compatible with existing AMSOIL by-pass filter mounts. EaBP Filters have a nitrile HNBR gasket and an orange silicone anti-drain valve. The two stage pleated and layered cellulose/full synthetic media has an efficiency rating of 98.7 percent at two microns. When used in conjunction with AMSOIL motor oil and an AMSOIL EaO or Donaldson Endurance™ filter, the EaBP should be changed every other full-flow filter change or up to the chart below. When used with other brands of motor oil or full-flow filters, the EaBP filter should be changed every other full-flow filter change. AMSOIL recommends using oil analysis when extending oil drain intervals. The increased fluid system capacity and filtration life provides improved oil cooling and ensures that equipment constantly runs on clean oil. Engine efficiency is increased and engine life is extended significantly. Increased oil capacity also extends the effectiveness of the additives and TBN levels in AMSOIL Motor Oils. AMSOIL has designed a new high-efficiency by-pass filter element that is also a soot removal device. AMSOIL Ea by-pass Filters use a synthetic/cellulose sandwiched media. The inner layer of the element is composed of a highly efficient cellulose media covered with a full synthetic media outer layer. These filters remove 39 percent of soot contaminants less than one micron. Soot removal efficiency increases approximately 10 to 14 percent when the EaBP Filter is used in conjunction with a standard full-flow filter, even higher in conjunction with Ea Oil Filters or Donaldson Endurance filters. The combustion process of diesel engines creates soot. After fuel is injected, combustion occurs with elevated soot levels as a byproduct of the process, and the combustion particulates become trapped on the exposed oil film. The rings wipe the particulates into the oil and the fine particulates aggregate, increasing levels of soot in the oil. Oil with dispersant additives will generally keep soot in the range of 0.002 to 0.5 microns in suspension; detergent additives prevent the build-up of sludge and act as an acid neutralizer, keeping soot in the range of 0.5 to 1.5 microns in suspension. These anti-wear additives work by providing a sacrificial chemical-to-chemical barrier. As the amount of soot suspended in the oil increases, the performance of these additives decreases. (Click on graph for larger image) As an oil’s soot dispersant additive level increases, wear reducing additives become less effective. This creates a direct linear correlation between wear and soot concentration; the higher the concentration of soot, the higher the level of wear. Today’s oil manufacturers are extending oil life by holding higher concentrations of contaminants, including soot, in suspension in the oil. They are also increasing fuel economy by reducing oil viscosity and oil film thickness. Therefore, even smaller sized contaminants are becoming critical in items in terms of creating wear. This further necessitates the use of by-pass filtration, especially in diesel engines. by-pass filtration comes standard on all heavy-duty turbo diesel engine applications from OEMs such as Cummins, Mack and many more. It has been available as standard equipment or as an option from OEMs like Caterpillar, John Deere, Case and others, but it isn’t just for heavy-duty diesel operators. by-pass filtration is a valuable commodity for anyone that wants to extend drain intervals and prolong engine life. It is also beneficial to vehicles that are exposed to high levels of contaminants on a regular basis.